Artists are nuts over Chunky Charcoal and so Cretacolor has created an entire range of colored charcoal with the same smooth character and chunky 3.5" x .75" diameter shape and size as the original Chunky product. These all new art sticks are also water-soluble so they can blend wet or dry, ground down to make powdered color to create washes and glazes or used in conjunction with other media for artistic variations. Set includes 10 colors and a stick of Chunky Graphite and Chunky Charcoal. 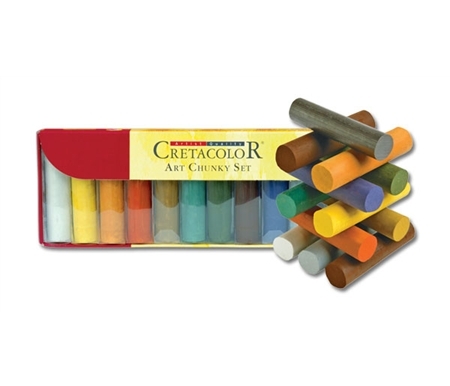 Cretacolor Chunky Charcoal Set is rated 4.7 out of 5 by 6. Rated 5 out of 5 by Bayberry Lane from Love these Colors I absolutely love these colors in charcoal! They are beautiful and a joy to work with. I hope they come out with more colors in the future, I would definitely buy them. This set will last me a long time. Rated 5 out of 5 by DonnanB from Great product Great product and very fast delivery! Very good product and just as described. So excited use this product. Much better than previous products and much less expensive. Thank you so much for your help and ease of order. I really love this and would recommend it to anyone. Rated 4 out of 5 by Susiiii 70 from Something Different I love the color choices.Helps to loosen me up for quick life drawings. Rather messy.I haven't been able to do a long pose with them.Takes some getting used too,because of there size.The size and the colors are what makes these unique. Perhaps using these on large paper would work the best. Rated 4 out of 5 by Meam from Large size, nice color I found one of these in a local store and they quit carrying it. So glad to find them at Jerry's. The olive brown has been great to use with black charcoal in my figure drawing class. Quick application and large areas covered when laid on it's side. Nice soft texture. Use fixative to finish piece. It's like a giant pastel stick. If you used these on fabric, could youheat set them? You will most likely not be able to heat set these colors because they are chalk or charcoal based. Oil sticks are oil paint in solid form. The same basic pigments and drying oils that are used in the formulation of tube paint are combined with wax and rolled into a crayon. They cure and dry permanently on fabric, just as they do on canvas (which is just another type of fabric after all). Cure for several days to a week before you heat set them for the best results. (Do not heat set before curing and do not skip the curing step.) Oil pastels are very similar to oil sticks but with one critical difference: the oil used in formulating oil pastels is generally a non-drying oil. Like pastels, they never dry permanently and will attract and retain dust and grime because of the slightly tacky surface. It's the reason pastel art work is always covered with glass while oils are not. Heat setting will not change this fact. Shiva oil sticks have the highest pigment concentration and that is why they are the most preferred for use with fabrics. It is also why they are at the higher end cost wise. There are several other brands available and student grades of many, including Shiva. ETA: One other note, because oil pastels are made with non-drying oil, they may continue to permeate fabric just as they do when used on paper. Fixatives are used on papers, but you wouldn't want to use them on fabrics. You can also heat set crayon or colored pencil drawings on fabric.